Couple of weeks back, I received an email from a gentleman who showed concern regarding the suitability of libertarianism for Nepal. Reading the email, I was grateful to him for his time and effort to show his concern and I also realized that if one wants to promote ideas of liberty in a society like ours, she has to take in account the collective nature of our society and culture. And hence, the ideas need to be adapted into actions that make sense to the members of our society. Recently , I also participated in a colloquium on Indian Liberal Tradition and during the discussion I learned that one of the pivotal work Indian liberal leaders of first generation did was adapt the ideas of liberalism into Indian context so that they became very relevant to the society they were being discussed in. Here, I present you the email I received and my reply. Although I am not a libertarian and in fact I do not agree with some of its core beliefs, I must commend you for your attempts to put your views forward. Individualism cannot work in Nepal for the time being because of the rigidly collective nature of Nepali society (and not so much because of the Nepali state, which barely exists). ‘Libertarianism’, or any other ‘ism’ has to be tailored to each society’s needs and aspirations. The failure to do so will only bring more confusion than previously existed. A country like Nepal—for the most part still living in the 15th century is not likely to accept the tenets of a new and rather radical system. People have been culturally programmed here not to accept responsibility for their actions. Anyway, these are just preliminary thoughts. If you want to debate them you can always email me. Thank you Mr. Gyawali for the email and your concern and sorry for my late reply. You are right in saying that Nepali society is rigidly collective in nature. However I differ with you when you say Nepali state is weak or barely exists, It barely exists when it comes to its basic functions such as law and order, administration of justice, handling of foreign diplomacy but in other aspects of life I find it pretty much strong and interfering. Just look at our history to date...first the ranas, then the panchayat, then the monarch, don't you think the state had been strong in those times although it may seem a bit weak at the current transition phase. The economic sphere and social spehere of the citizens of this country has always been controlled by the state. The exorbitant tariff rates , restriction of foreign direct investment, inflationary monetary policy, cumbersome license permit raj and the massive corruption, state backed cartels and syndicates, highly politicized trade unions that are major impediment to our industrial growth, massive corruption and inefficiency through public enterprises and so on...what do you think about that? Regarding relevancy of libertarianism, I take it more as a philosophy of life as compared to an ideology. I agree that it is a philosophy developed from the western thought but i also believe that its principles are more of universal nature (such as that humans are rational beings, free markets bring prosperity, private ownership brings better handling of any resources, spontaneous order emerging through markets is better form of organizing a society rather than an iron fist). For me it's primarily a way of living life and viewing the world and then secondarily a way of organizing our society and taking nation forward. I find it hard to believe that a long defunct-ridiculous and proven wrong world-wide philosophy like communism can flourish in our country even though we Nepalese have fought for our freedom time and again. I believe the collectivist thought of Nepali society has been accentuated by the leftist political parties and leaders even though i agree our society and mostly Hinduism is somewhat collective in nature. However, there is also this fact that even Hinduism has liberal aspects to it in the Charvak school of thought. I wholeheartedly agree with you when you say any 'ism' has to be tailored to meet a society's need and aspirations and sincerely believe libertarianism in its purest sense won't be applicable here. Various dimensions of our society like diversity, caste systems, culture should be taken into consideration. I might believe in an individual's right to bear arms but i would not necessarily advocate it in the context of Nepal, I might believe education isn't a basic human right and state has no business in providing education and yet i would support state's minimal involvement although i would advocate some private components in it such as the education voucher system. However, i also believe that the so called "perfect time' for liberty never comes. 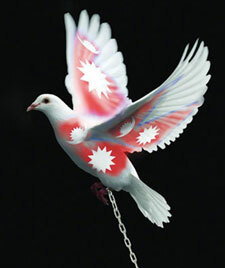 I find it rather foolish when people say Nepal is not ready. what the heck...if it's not ready for freedom and prosperity then it can't be ready for anything else at all. There are examples of countries like Poland and Estonia who jumped from totally communist structure to free market structure. People there had hardly any sense what price of a good or service meant at all but still they did it. And they happen to be the most prosperous and vibrant societies among the nations that separated from USSR. By the way, i was wondering what were the tenets of libertarianism that you disagreed with. It would be interesting to discuss, I believe. So what do YOU think about the suitability of libertarianism in Nepal. Please share your thoughts, agreements and disagreements in the comment box below!